The ver­sa­tile Jen­nifer L. Holm pens a fan­ta­sy this time around, but it’s a sto­ry suf­fused with humor and sci­ence, deft­ly ask­ing a mind-blow­ing ques­tion: is it a good thing to grow old? So what hap­pens when a 13-year-old boy shows up on your doorstep, argu­ing with your mom, who invites him in, and it turns out you’re relat­ed to this kid, only a much old­er ver­sion of him? Eleven-year-old Ellie’s grand­fa­ther is the famous sci­en­tist Melvin Sagarsky (he has a fan club in Fin­land), who has invent­ed an age-alter­ing sub­stance that he’s used on him­self as his first human exper­i­ment. When he shows up on her mom’s doorstep, the younger ver­sion of Melvin is still the same self-absorbed, rule-spout­ing, sci­ence-focused grand­fa­ther who hasn’t vis­it­ed often because he and his daugh­ter are so dif­fer­ent in tem­pera­ment. A 13-year-old boy can’t stay by him­self, or dri­ve, or buy gro­ceries, or not go to school, so they are sud­den­ly a fam­i­ly. Grand­fa­ther opens Ellie’s eyes to the cool aspects of sci­ence and the celebri­ty sci­en­tists and she dis­cov­ers she likes sci­ence. Ellie starts notic­ing things around her in a dif­fer­ent way and read­ing about the lives of the peo­ple who changed the world. Will her grand­fa­ther be one of those peo­ple? Has he dis­cov­ered a foun­tain of youth? Will he ever see eye-to-eye with Ellie’s dra­ma teacher moth­er? 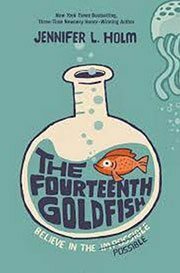 The Four­teenth Gold­fish works on many lev­els, but I admire it because it’s so read­able even while it’s pos­ing big ques­tions. The book is fun­ny, has good pac­ing, and the characters—all of them, even Grandfather—are so like­able that you’ll close the book won­der­ing what hap­pens next.